Texting is a great way to bring customers back to your store. According to research conducted by the website business2community.com, the open rates for text messages is an extraordinary 99%, with upwards of 90% opened within three minutes of receipt! Texts are read within minutes which makes them a great way to spark an immediate interest in sales and same-day promotions. Customers who choose to communicate via text are very particular when it comes to the loyalty programs they show an interest in and those they will join. If they do participate, rest assured they are very interested in what you offer as a business. Plus, tech savvy customers are much more engaged than the average customer and can end up being a brand or product cheerleader for your business. Reward them for their efforts! Customers will not come back if a business doesn’t act like they want them back.They also will not make a second appearance unless they are given reasons. A successful business must offer a quality product, but even a great product isn’t quite enough in this day and age. No matter how big a company or how loyal its consumers are, business owners and managers are constantly working to nurture those customer relationships in order to have continued growth. The nice thing is that communication doesn’t have to cost a lot. According to Forbes, providing rewards via text message builds engagement and encourages users to come back, benefiting a business far beyond a tangible purchase while also benefiting the customers with a tangible reward. This tactic creates the much sought-after customer loyalty, providing a long-term financial benefit to the business by creating customers who keep coming back. Happy customers. Happy business owners. It’s a win-win for all! A loyalty program using text messages will bring customers back to your store. 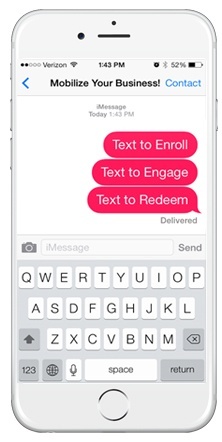 Tecmark's All Digital TextToEnroll program allows you to send targeted offers via text to your members.